Wedding PR: About.com, Brides.com, WeddingWire and more! We hope everyone is enjoying the Fall season and gearing up for the holiday! We are thrilled to share some of our latest client features including About.com, Brides.com, WeddingWire and so much more. See more below. LadyMarry, Passport to Joy, Rentivist, Where Will They Stay? 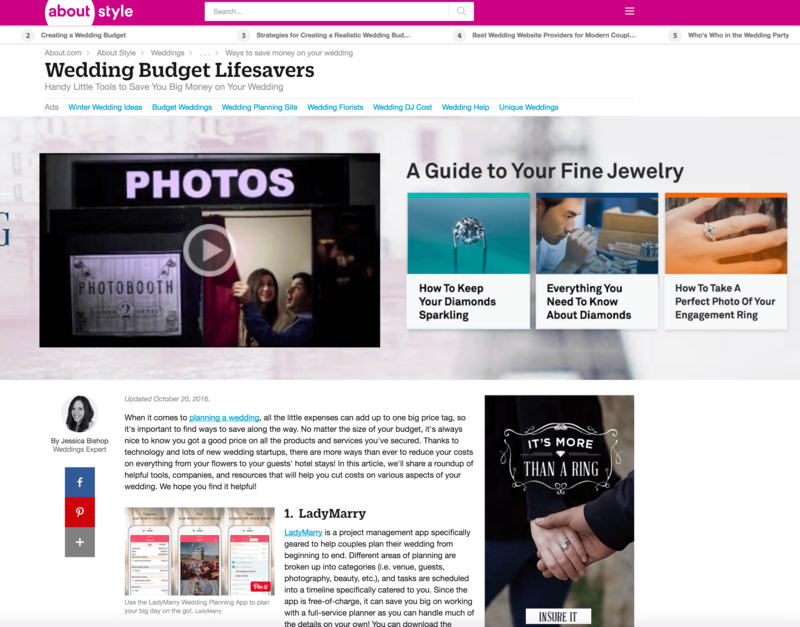 and NOLA Weekday Weddings were featured in the About.com article Wedding Budget Lifesavers. See the full feature here. 100 Candles, Fantasy Sound Event Services, Belladeux Event Design, Cocoon Events, and Mike B Photography on Huffington Post in the article Finding Inspiration for Your Wedding (Beyond Pinterest!). See the full article here. Taylor’d Events was featured on WeddingIQ with her guest article Using the Off-Season to Build Client Experience. See the full feature here. 100 Candles was featured on Belle Magazine in the article What Really Happens at Bridal Fashion Week. See the full article here. Destination Weddings was featured in the Brides.com article 12 Foolproof Steps to Planning the Best Honeymoon Ever. See the full article here. Fantasy Sound Event Services was featured on AllSeated with their guest article Event Lighting and Decor Trends. See the full article here. OFD Consulting was featured on Voices of TSE with her guest article Media Relationships: How You Can Get Your Name in Lights. See the full article here. Destination Weddings was featured on Catersource with their guest article Trend Alert: Luxury Destination Weddings. See the full article here. Fantasy Sound Event Services was featured on Catersource with their guest article Roundup: Indoor Wedding Lighting Inspiration. See the full article here. OFD Consulting was featured on WeddingWire EDU with her guest article Wedding PR: Developing Your Speaking Platform. See the full article here.